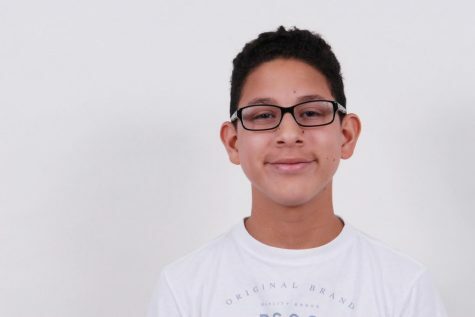 Cesar Luna is a 14 year old freshman a South Broward High School. He joined journalism is because he loves interviewing people and wants to get better at it, saying,"It seems like fun." He is passionate about marine science, and doing well in school. His academic strength is math, and his weakness is language arts. He doesn’t really read any media. In 10 years, he would like to be a Marine Biologist. When he's not in school, you'd probably catch him playing video games or listening to jazz; that’s his favorite type of music. He enjoys the smoothness of jazz. If he had a superpower, it would be teleporting. He'd use it to go to all the cities he has been dreaming to go to. He would love to visit Australia, Japan, and Alaska. His all time favorite food is pizza. The taste of cheese, the sauce, and pepperoni all together make a combination the he loves. His favorite animal is a kangaroo. His fears are spiders and heights. His favorite movie is the Hunger Games. He likes how intense it is and to see how the characters fight, their techniques.